Are you planning to buy a new house? Wondering how your room would look like? Were you thinking about how you can design your interiors so it would look better? Well, that’s a lot of planning right? This unique application named Live Home 3D Interior Design allows you to design your room/home out of nothing in less than 10 minutes. The app has floor plan tools, real-time 3D environment, 3D models and materials, roofs and dormers, and a lot more. Using this app one can enter room dimensions, design the floor pattern, add the desired wall color and begin weaving their dreams into reality. With this app, all you have to do is to select the object you require, just tap in the place where you need it and then position the object precisely just by holding and dragging it with your finger. Designed by Belight Software, ltd, Live Home 3D is affordable and is ultimately user-friendly. It lets you know how the tools work as you make use of them. The app allows you to import objects like furniture, plants and windows from the Trimble 3D Warehouse. The app has many features like roof assistant with 12 roof templates, customizable roof options to add segments and 16 dormer templates. The app also facilitates exporting your draft of the designs and send it to yourself or others in JPEG, TIFF, PNG or BMP formats. Live Home 3D Interior Design app belongs to the productivity category and is compatible with iOS 11.0 or later versions. The company’s website is so easy to navigate and has a lot of information that is essential for the users. The FAQ’s has a lot of answers to the common queries that might arise with the users. The app has many pro features like unlimited floor levels, elevation view, custom shaped roofs, polygonal-based block tool for drawing balconies, porches, and more, FOV (field of view) and parallel camera projection, light editor and a lot more that can be utilized via an in-app purchase. With this app you can create your home interiors with a few quick and easy steps and walk into your dream house in 3D with augmented reality (AR). Live Home 3D is one of the best home design softwares available that lets you to design houses of any complexity with ease. The app is definitely a boon to novice home designers and I would recommend it to all my friends and family who are planning to construct a new house. In this busy world, everyone of us face a lot of problems in our daily life. Be it our home or work place, we come across numerous situations that put our patience to test. We definitely need something to boost our body and mind and get back in peace in just a few minutes. 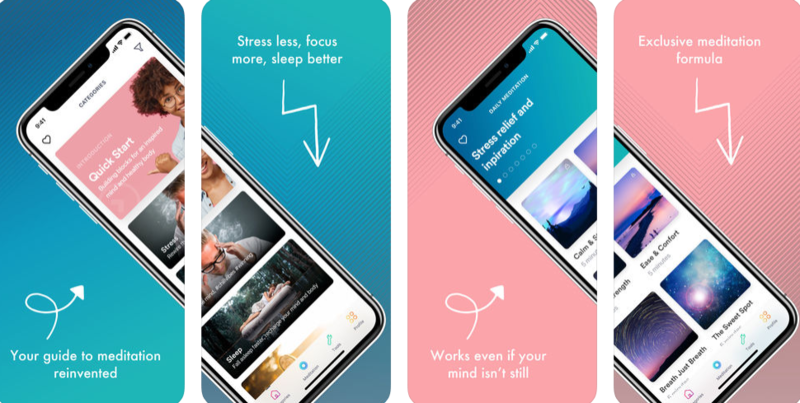 One unique app released by SOS Method Inc, helps people come out of this stressful life, maintain a work-life balance and cope up with stress and anxiety. Meditation can always help save your mental and physical health. The SOS Method: Meditation app works anytime, anywhere providing instant access to an inspired mind, physical and emotional wellbeing. With the team’s neatly crafted meditation, life tools and programs in the app, all you will need is just 5 minutes, to become happier, healthier, more productive and mindful. The app allows me to handle all the life problems and help me lead a smooth life. The app is definitely something that I would recommend for all of my friends. Stress Relief and Inspiration, Relax and Deep Sleep, Soothing and Therapeutic, Whisper Collection, Revitalize during Activity, Words have Power, Emergency SOS; Calming anxiety, Forgiveness and Love are the various meditation methods available in the app. The app aids you to soothe and revitalize your busy mind, minimize stress, depression and anxiety, have a better focus, creativity and sleep. The app has four tabs namely: Home, Meditation, Tools and Profile. Using the profile option in the app, you can create your own profile, earn badges, invite friends and do a lot more. The app even has tools to handle your rough day, make space for love and turn your dreams into reality. As you select on a particular tool, you can play that particular video that runs for a few minutes and can see yourself feeling relaxed with in a short period of time. The meditation portion of the app is where you find various videos of different lengths that help you relax. The Home tab displays all your latest activities on using SOS Method : Meditation. Belonging to the Health and Fitness category in the Play Store, the app is suitable for everyone above 3 years of age. When you want to give yourself a deep breath or find a way to relax your mind SOS Method : Meditation can always come in handy. Sell unwanted gift cards & treat your friends with DapIt! Gift cards can be a tricky gift to give (and receive). Maybe the gift card is for a store you never use, or you’d rather just have the money to spend on whatever you want. DapIt is here to change the way we think about – and use – gift cards. It’s available to download now on Google Play and iOS. Primarily serving as a virtual wallet for your gift cards – so your actual wallet doesn’t need to be super bulky – it also features a gift card exchange where you can sell unwanted gift cards for cash. Small fees and reasonable processing times make this app a viable way to turn useless gift cards into money. Money you can spend anywhere. Anywhere! It’s not just for getting rid of gift cards, though. DapIt takes the hassle out of buying them for yourself, friends, family & loved ones. Hit the browse button to take a look at the local businesses on the platform. You’ll find a variety of businesses, from shoe shops to taco shacks. Buying a gift card takes seconds and you can send it to any of your friends via text or email. Not sure what gift card to buy? We won’t call you a bad friend, don’t worry. DapIt lets you receive a notification when a friend checks in to a supported business. From there you can give them a surprise gift card instantly redeemable at that place. Don’t let anybody tell you that you aren’t spontaneous! DapIt is a powerful marketing tool for local merchants looking to grow their business. Gift cards are one of the most effective ways to increase customer loyalty and this app lets businesses use & process electronic branded gift cards in a way that’s so simple, there’s no reason not to be using it. Whether you need a convenient place to hoard & manage your gift cards, you want to surprise a friend or trade in a never-used card for cash, DapIt makes things easy. Download the app now on Google Play and iOS or visit www.DapItApp.com for more information. If you are an investor, fund manager, resource banker, trader or any other market professional who trade with oil or energy sources, then you might need some source to look out for info on the latest energy news. One app that provides this information is OilPrice: Energy News. The Notable Features of OilPrice: Energy News include the real time market data, the personalized watch list, the tracking feature of the latest oil prices, its largest community and an extensive coverage of the world news. The community allows you to start discussions, create a blog and view the latest discussions online. OilPrice : Energy News is regularly followed by many famous news websites to keep themselves updated with the latest news and industry analysis. The CNN Today, Business Insider, Time Magazine, NASDAQ are some among them. The app is faster and easier to use than any other apps out there. The numero uno feature of the app is its customizable option. The app keeps you up to date with the oil blends that you need to track. The design, GUI and quick response of the app are its other added plus. The app has five individual tabs each with a different purpose. The app displays regular notifications once you set the target in the settings option, to keep you informed with the stock details once they raise or lower. The app helps you to stay up to date on the energy market along with prices on various oil blends that include WTI Crude & Brent Crude, OPEC blends, Canadian blends and US blends. Individuals from all around the world but mainly North America, Canada, UK and Australia follow the website regularly. Oil Price: Energy News has a much dedicated team that respond to people feedback on the app through Twitter and Email. With the app, you can also share the latest news or articles with your close ones in the social network like WhatsApp, Facebook, Gmail and the lot. Compatibility: Android 6.0 and iOS 10.0 or later versions. The app is compatible with iPhone, iPad and iPod touch. Make your own Video Invitation with the help of “Video Invitation Maker” of Inviter. How it sounds! If you make a Video Invitation with your own photos and music? Definitely, it will be a wonderful experience for you. “Video Invitation Maker” of Inviter is one such app that provides different templates for making Video Invitations. It is available on the Google Play Store for all Android Users. This app suits for all kinds of events like Wedding, Engagement Ceremony, Birthday Party, Baby Shower etc. Can Create video Invitations for events like Birthday, Wedding, Baby shower and others. Upload images and music of your own interest. Once you are all set with the preview you can make payment and Create HD Quality video. The whole process takes from 2 to 10 minutes. With one click share it on WhatsApp and other social media platforms. 24 X 7 Support (through WhatsApp or Chat). How to make the video invitation? Follow the below steps to create a Video Invitation. Using Inviter’s “Video Invitation Maker” app is so easy. The design is very simple. Simply select a template, upload your own photos, enter event details and music and you can preview it for free (any number of times). Once you are set with preview, you can pay and the app will create a final HD video and send you an email once it’s completed and ready to download. The whole process will only take 10 minutes maximum. Inviter App is the best app that I love to use while inviting on any occasion or event. It’s simple and user-friendly in all the way. I would recommend downloading this app. Summary: Inviter app is a user-friendly Invitation app which helps the users to create, download and share the Video Invitation within a few minutes easily.